SOFIA, BULGARIA / ACCESSWIRE / February 4, 2018 / Credissimo brought home two awards from the annual business awards of Forbes magazine. The leader in online lending received the prizes in ''Financial Sector Innovations'' and ''Quality of Services'', respectively. 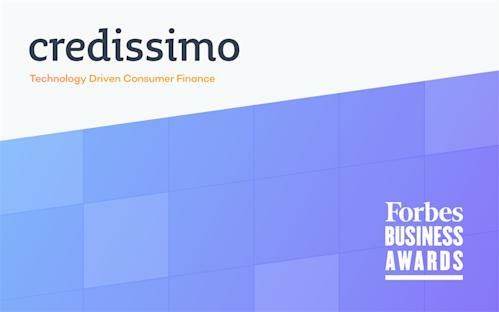 The honours are yet another acknowledgement for Credissimo's strive to be constantly at the innovation frontier, while maintaining highest client satisfaction and contributing to the overall development of the Fintech Industry. ''The Forbes Business Awards 2017 are a much deserved and appreciated recognition for the team's many accomplishments this year. The two awards are proof that our strive to deliver evermore convenient and groundbreaking services in the lending sector have been in the right direction and have even exceeded expectations. We cordially thank the jury and the organisers and wish much success to all entrepreneurs out there,'' said Sokol Iankov, CEO of Credissimo. Credissimo has managed to impress the jury with its many innovations that have made the user experience an incomparable one. Pioneering outstanding technological solutions, impeccable customer service, and aggressive Pan-European expansion are just a few of the reasons for the awards. In recent years, Credissimo's team has introduced unparalleled technologies - the world's first chatbot for online lending; repayments in cryptocurrencies and automated processes that further enhance the client's experience. Forbes' Business Awards are announced once every year after a careful selection process that aims to encourage best practices among industry-leading companies, by rewarding innovation and entrepreneurship. Credissimo's team will continue to foster novelty by expanding its presence in the cryptocurrency world with its new project - Nexo, The World's First Instant Crypto Overdrafts. Nexo, powered by Credissimo, will extends overdrafts, secured by digital assets, such as bitcoin and ethereum, thus paving the way for an entirely new approach of enjoying crypto-wealth, without having to sell it. More on Credissimo and Nexo can be found at www.credissimo.com and www.nexo.io.